When a young Australian con artist discovers a book titled Gould’s Book of Fish, a book with paintings of fish as well as a man’s story as a convict on Van Diemen’s Land in the 1830’s, he becomes obsessed with it. And so, begins the story of William Buelow Gould, his adventures before and after his incarceration on Van Diemen’s Land, the people he meets and how he becomes a reluctant painter of fish. Gould’s Book of Fish is a weird one. It’s funny and gruesome and fantastical and sometimes makes very little sense at all. William Buelow Gould is a witty narrator as he recounts his life and his exploits, the way he notes his limitations and then straightaway goes against any common-sense is often farcical and hilarious. The situations he gets himself in are almost like watching a car-crash in slow-motion, you cant look away and instead are captivated and horrified. The historical setting is an interesting yet brutal one. The descriptions throughout the novel are incredibly vivid, for instance, the way the prisoners are punished is cruel and disgusting and it doesn’t shy away from the brutalities that the prisoners experienced. Also, the way the landscape of Van Diemen’s Land (what we now call Tanzania) is described makes the location seem just as harsh and unforgiving as the people who are living there. A lot happens in Gould’s Book of Fish and it doesn’t always seem believable. In fact, the way the story ends leaves you wondering what’s real and what’s not and even if the character of William Buelow Gould was actually a real character in the story or was he a stand in for someone else. It’s a fantastical story, especially with the prominence of the fish, each of them being related to either a significant character or event in Gould’s life. The fish are a part of him and his connection to them ends up being an almost magical thing. Though, a magical thing that’s not always logical. I listened to Gould’s Book of Fish on audiobook, which I think certainly helped me follow the story thanks to the brilliant narrator Humphrey Bower. I don’t think I would have got on with the book if I was reading a physical copy. So much happens, and not always in a linear order, that it would perhaps be a bit of a dense book to get through. The audiobook had a great narrator though and made the nonsense story just a bit more understandable. 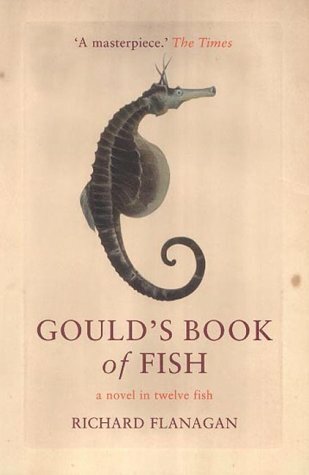 Gould’s Book of Fish is a weird but enjoyable read. It’s got some bizarre characters and the situations Gould ends up a part of are often bonkers and farfetched, but they’re certainly not forgettable. 4/5.